Matt and Mark own this mostly organic garden store, and I have gotten all my plants and organic fertilizer from them. These boys are just so nice and earnest. If ever I have a chance to have sons, these two boys would be whom I hope to have. Well, maybe shorter than Mark and Matt because I am a bit height challenged. 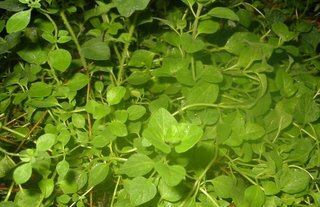 Anyway, I got my oregano, parsley, sage, rosemary and thyme (isn’t that a song?) seedlings from them, and these organic plants are the hardiest plants I have ever seen! I love these boys, and I am a complete convert to organic plant purchasing and growing from their garden store! I went to the Amish Farmer’s Market today, which is in the Radio Shack & August Moon parking lot in Green Hills, and found some Japanese eggplant, summer squash, hot peppers, and green peppers. As I was purchasing my lovely veggies, the lady at the register said that if I came on the weekend, there would be Amish Fried Pies and Amish Bread, and on Fridays the Amish farmers bring freshly picked veggies. I looked around, no pies and no bread, and low supplies on veggies. Note to self, I must try an Amish pie soon, block out Saturday for Pie tasting. With absolutely no direction with all these fresh ingredients, I did what a one-pan wonder would do. 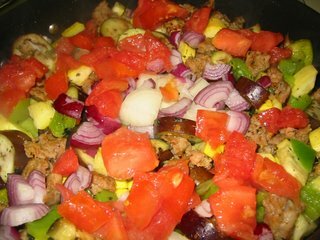 I diced up all the ingredients, tossed ‘em into the pan, added some garlic, red wine and tomato paste, and let it become what it is. I did cook up some corkscrew pasta to toss that in later. Not too shabby for a toss together meal. 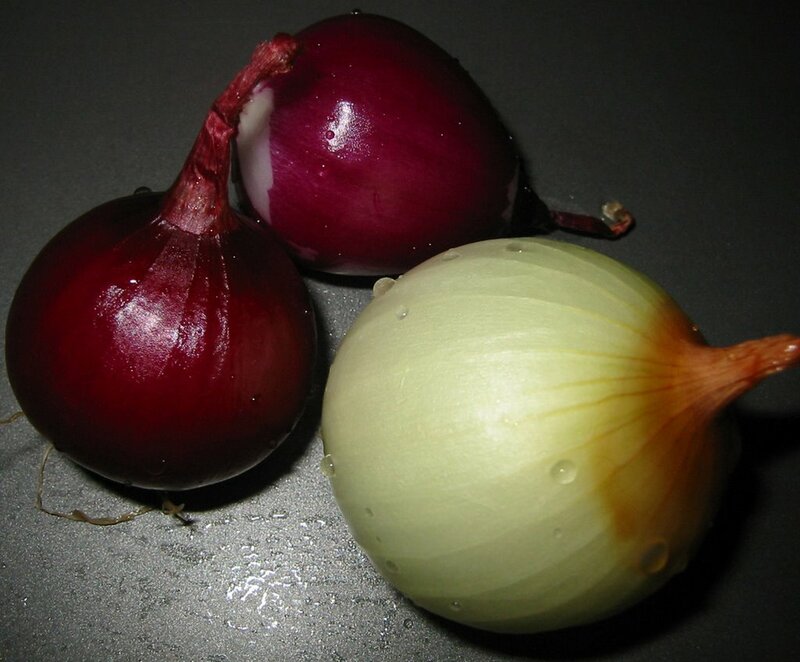 I rarely cook with recipes, and when meals come out well, I may not be able to duplicate. This one came out well, and I hope to duplicate some day. Wish me luck! Yesterday, after one whole week of wanting to pick more blueberries to make blueberry crisp, blueberry muffins, blueberry pancakes, blueberries straight up, etc. 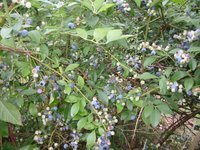 I started out on my journey to go to the super secret blueberry patch. It was not raining at my house, and I thought YIPEEE! what a perfect berry day with no sun and cool July weather, so I started south on I-65 to Franklin with much anticipation. It got darker, stormier, and then it was pouring down buckets like in the movies. It was pouring so hard I almost had to pull over. My heart sank the further I drove into the storm. I got off the highway at the exit, and as I made my turn down the super secret road, it started to clear up some. By the time I got to the bluberry patch, it drizzled for anther 5 minutes, and it stopped raining. 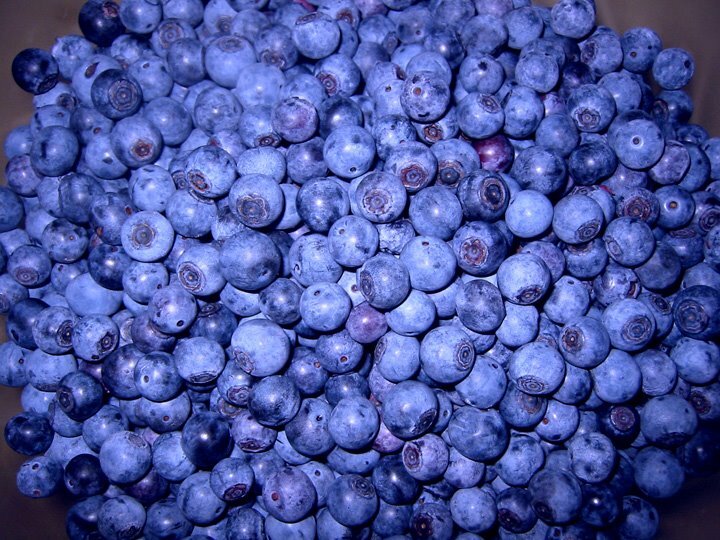 It turned out to be the best blueberry picking day yet! Ah, blueberries! 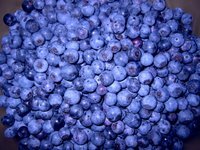 So, I went blueberrry picking for the first time, and July is the perfect time to pick blueberries in the 'burbs of Nashville. 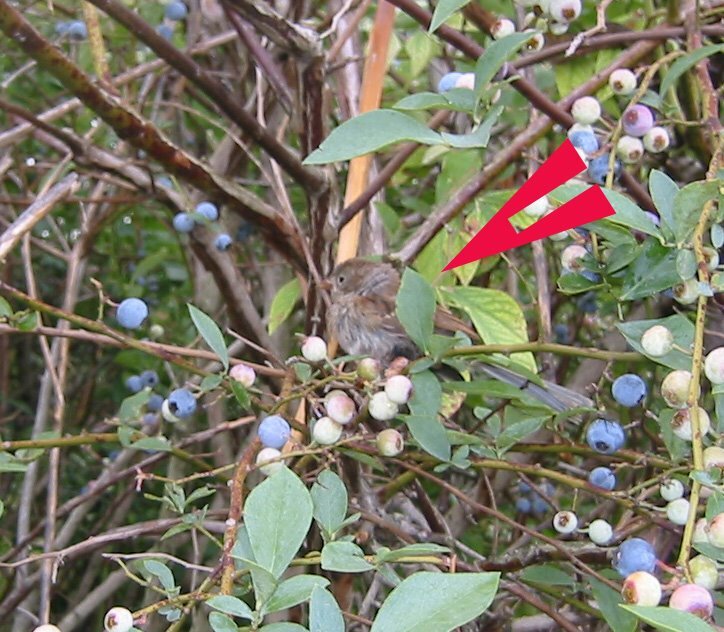 When I got to the super secret blueberry picking place, I saw the cutest little teenaged bird in the blueberry bush. I say the bird was teenaged because it still had some fuzzy feathers on its tail, it was small and not full grown, but not a baby bird. I took my photo and went on my way. 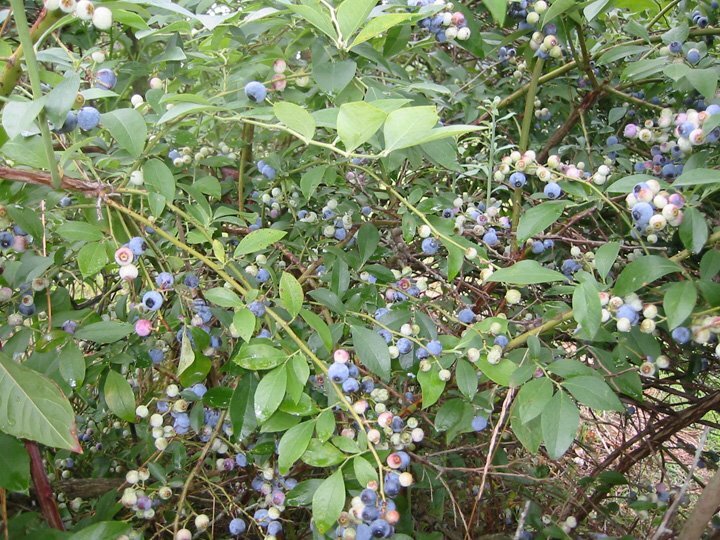 I looked around for a bush with lots of blueberries. 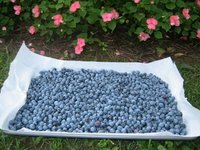 I had a soft-side lunch box with a shoulder strap to collect the berries, and I started picking the firm purple berries and putting them into the box. One for me, one for the box, two for me , one for the box, two for me, one for box, etc. Then I saw the Joe Pye weed growing up through the blueberry bushes with the stormy skies behind them. I just thought I had to take a photo of these beautiful weeds before I knock them over, rip them from the ground and clear them from the blueberry bush. All that remains of the Joe Pye weeds is the stormy photo of them. Don't think I am too cruel to plants. Joe Pye weeds compete and win over resources, and suffocate the blueberry plants. 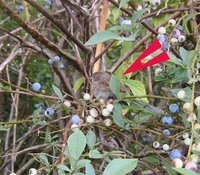 The keepers of the blueberry plants do not use herbicides, so the only way to control weeds is to do it the old fashioned way: hand pull them. 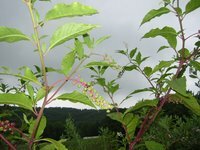 After the Joe Pye weed encounter, I turned to take a look at the blueberry patch's neighbor, and I really thought how pretty the countryside is. Just look at how gorgeous this farm is while being only 20 miles from Broadway in downtown Nashville. 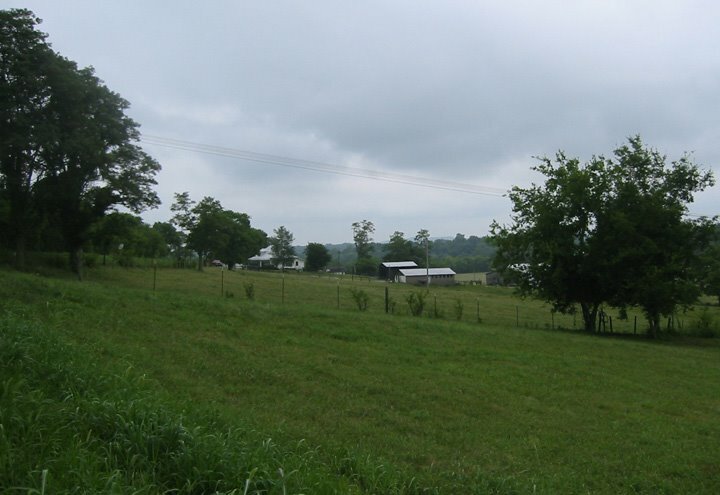 The view of the neighbors is exactly like one would vision while reading a book about the Tennesse countryside. So back to three for me, one for the box, three for me, one for the box. After 2 hours, I was full and I had about 2 quarts of sweet, tart, flavorful berries. I took them home, washed them and air dried them. I placed the rinsed berries on a jelly roll pan and towels to dry them , then I took the pan outside to my neighbors front flower bed and took this lovely picture. This picture is a slice of what I get to see every day when I get home (a house beautiful flowerbed), sans blueberries. I made a blueberry crisp the fattening way (for the first time the fattening way) with sugar, butter, granola and flour (albeit whole wheat). I made the crisp topping part with a stick of butter, a cup of flour, 2/3 cup sugar, 2 cups of granola all crumbled together and refrigerated. The berries, I rinsed the blueberries then added 1/4 c sugar, pinch of nutmeg, pinch of star anise, 2 tsp cornstarch to coat the berries. 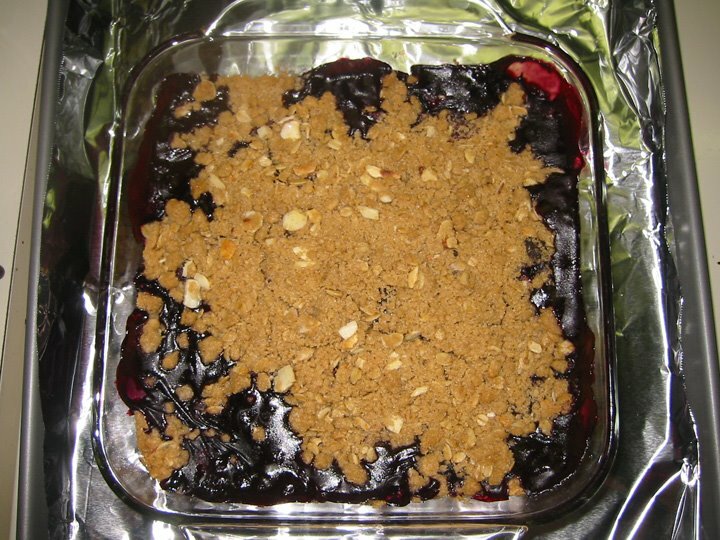 Tossed the berries in a greased pyrex, topped with the chilled crumble topping, then baked at 350 degrees for 30 min, or until I wanted to eat it. Granola I made from 6 cup rolled oats, 1/2 cup oil, 1/2 cup soy milk, 1/3 cup honey, raw sliced almonds, pecans or other nuts, pinch of salt - all mixed to moisten all oats, then dump onto a jelly roll pan to toast at 325 degrees for 15-20 min turning once until lightly golden. I don't buy processed cereal, I just eat my granola. I like it! 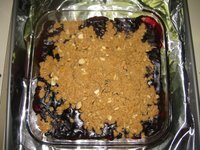 There is a skinny way to make the blueberry crisp, and that is to put only granola on top of blueberries before baking. I have always made crisps the skinny way. I use just granola with other fruit too, like apples, and it tastes just great with only the granola. I had no idea that added sugar and butter even existed for blueberry crisp until now! The buttery way was truly a treat and devine. The skinny way, which was good when I did not know any better, is just a faint memory for me now. Now that I have been to the dark side of sugar, butter and flour to top a crisp, not just my low fat granola, I now know what is devine in the world of crisps! Oh, why did I have to go to the dark side of desserts? I was happy with just fruit and granola, but now things are different. Oh my, the sweetness of the sugar, the richness of the butter, how can I live without the fattening way of the crisp? I finished off that fattening crisp in short order, along with the bowl of berries in the fridge. My fingers are itching to get more berries, and make yet one more blueberry crisp the fattening way. Oh the day of more berries! Please, tomorrow come so I can get more berries! Oh the fattening Blueberry Crisp calls my name! Buehler Vineyards was the 4th and last stop in the short trip to Napa . This stop was fascinating because everything visually was like stepping into a Napa romance novel. We got to the front gate of the estate, and we saw the horse who lives near the gate. We saw Page, the son of John Buehler, Jr, tending to the care of their horse (obviously well cared for) next to a wood-sided barn like you would see in the Pennsylvania countryside. We drove up the winding driveway to be greeted by the John at the front of his house, which is villa-esque. John is completely the rugged-man's rugged man. If you were on a ranch, and you imagine the seasoned ranch manager, who is friendly and welcoming, on a grand chestnut colored horse, it would be John. He gives the impression that he is a working man, is doing work of a working man, and is providing a fair priced product for every working stiff out there. The reality is that he is a working man who does very well for himself and his family, he does work at his family vineyard, and he provides very fair priced products for everyone to enjoy worldwide. 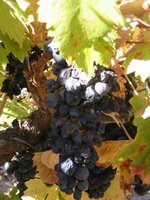 The interesting part about the Buehler vineyard is that they are completely traditional and low tech when it comes to growing zinfandel grapes. About the Buehler zin, forget about trying to buy this wine, as it flies of the shelf in a day (after the Robert Parker write up saying this is the best value ever for red zin), and is reasonably priced at about $15/bottle. I was able to try a few bottles from 1998 on a cruise, and the zin had a nice balance of tannins and fruit, had a deep purple garnet red color, and had a velvety feel. It is a great value if you can find it. 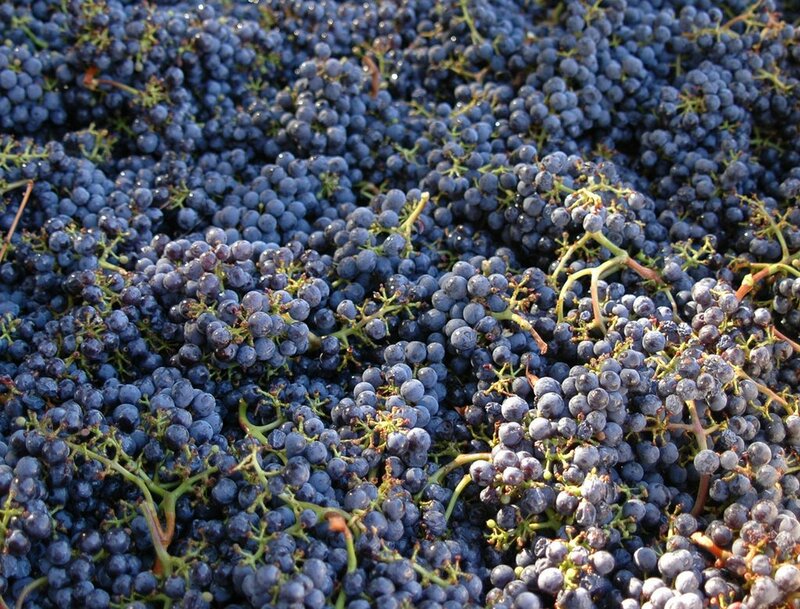 What impressed me the most was the old French way Buehler grows the zin grapes. 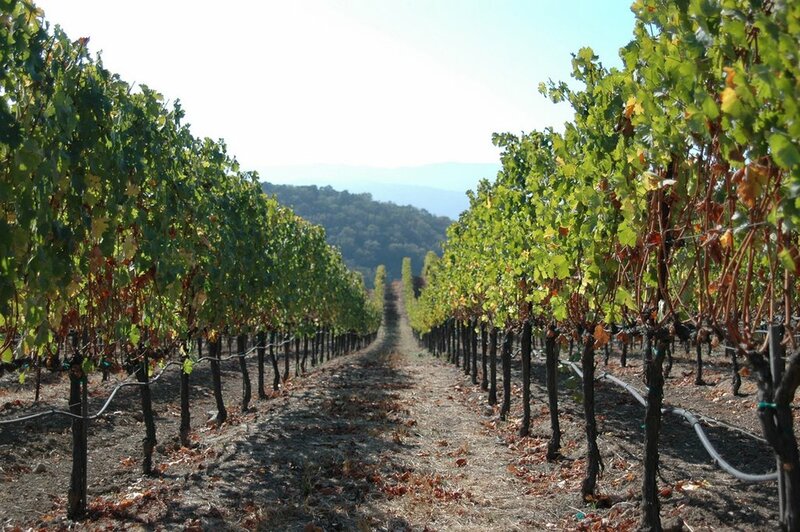 Buehler was the only vineyard I saw to do this: Each vine has a wood stump placed next to it, and the zin vines are not "trained" onto vine-lines, not pruned, not pampered, and the zin vines are allowed to grow naturally around the stump as it would in the woods around a tree. They do not irrigate the vines either. This is as traditional as you can get to growing grape vines. I love the idea of taking excellent old world techniques, tried and true, to grow excellent grapes and honor the land and the plants. 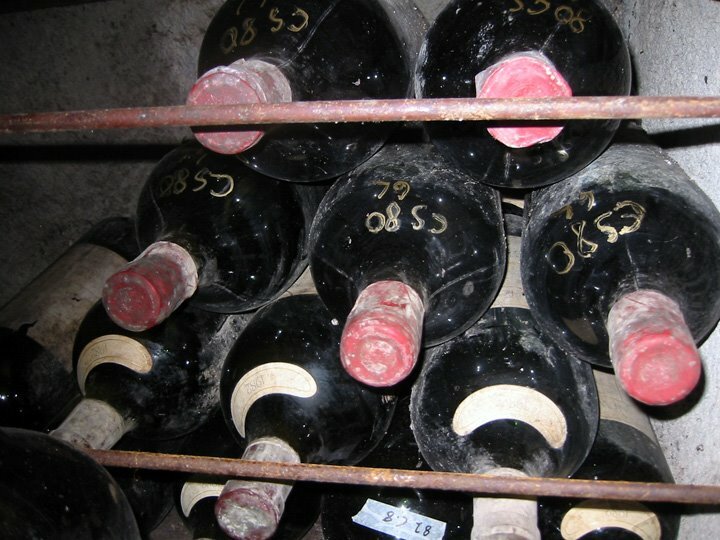 John Buehler may sell his wines at reasonable price, but he still uses old European methods to make his wines. 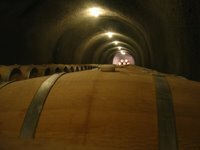 He uses the best Italian made stainless steel equipment to process the grapes, he uses time-tested gravity clarification techniques, and he uses both American and French oak barrels for aging. The only high tech option he uses is synthetic cork with his non-reserve lines. I was surprised at that, but synthetic cork, pretty much guarantees that the wine will NOT be spoiled by a leak in the cork. Having sipped on at least 1/2 doz bottles of Buehler's synthetic corked bottles, I am sold on the new technology. If John Buehler had to give into one new world technology, he picked the right one. 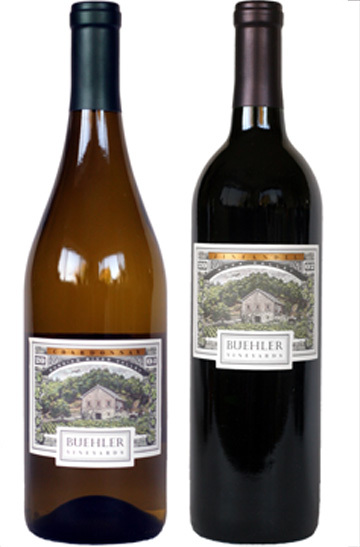 I downloaded these photos of the Russian River Chardonnay and Buehler Zinfandel, the 2 favorites of mine from Buehler. 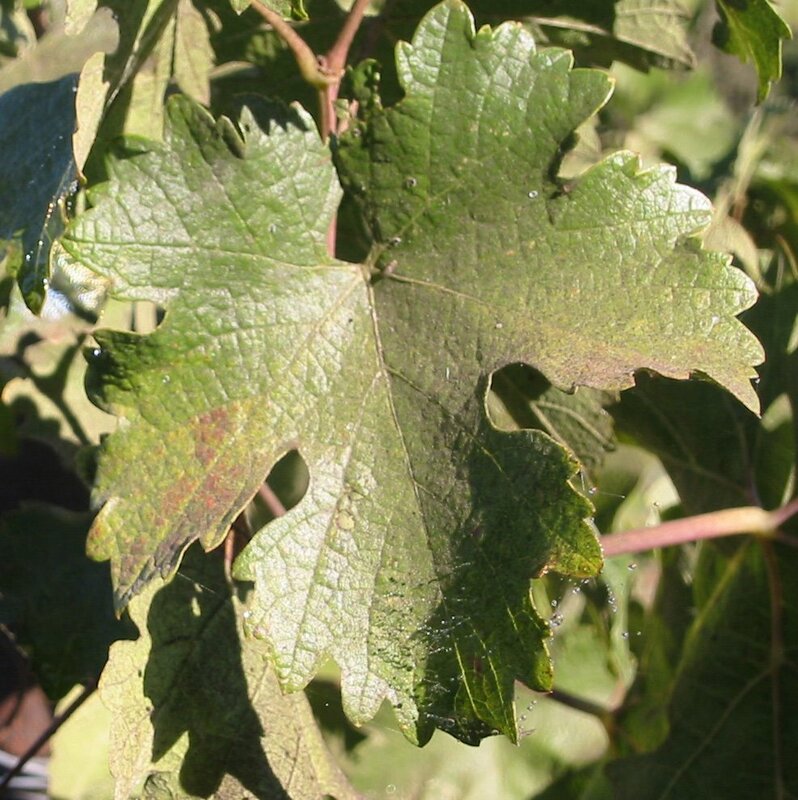 The Russian River Chardonnay is well balanced with a little citrus and ripe pear (none of that nasty sour apple candy malic acid), and is perfect for a summer day. Newton Vineyard is another beautiful place in Napa, but instead of being rustic, it is all about the English Garden, and 100 % primping and shaping plants into the perfect garden design. Mr Newton is from England, and he just loves the English Garden that grows in the land of mist and peat. Defying all odds in this land of rock and dry air, he manages to have his gardeners keep all his gardens perfectly green and manicured. While we were taking a tour of the Newton Grounds, we were in an area that looks like a lab. There were grapes in the little pumpkin bucket, I think mostly for show. The other lab equipment is meant for liquids, and boiling liquids to determine water and alcohol content I guess. The lab room was a nice bright and sunny room attached to the visitor area. As we toured the wine making area, we came upon cellar cells with Newton Reserves. 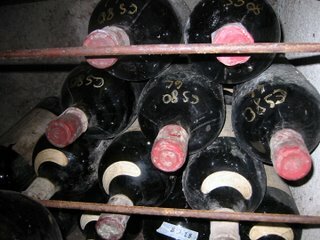 These are 1.5 L bottles of 1980 cab I think. They are not for general sale. One interesting thing we got to do was to smell a new French oak barrel before wine is put into it to age. The inside of the barrel was charred, and smelled like deep rich vanilla and caramel. It was heavenly. That scent is going to help make some wine smooth, velvety and have a hint of vanilla. 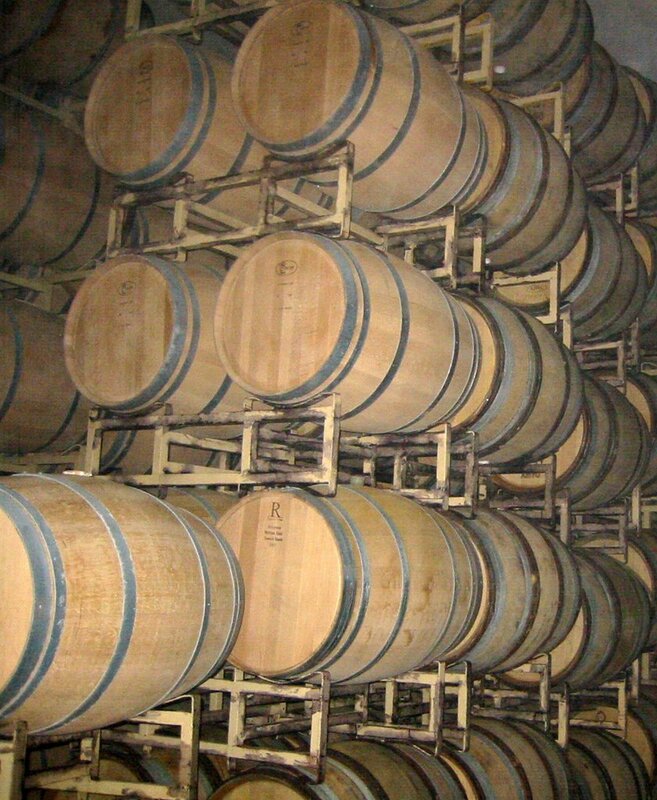 How amazing is it to have wine age in the oak barrel, have the essence of the charred oak transfer into the liquid wine, have the wine bottled for years, and then when the cork is popped off, that same scent I smelled will be in the sippers nose years later. As we made our way to the tasting room, we met Mrs Su Hua Newton, the winemaker. To my surprise she is Chinese! 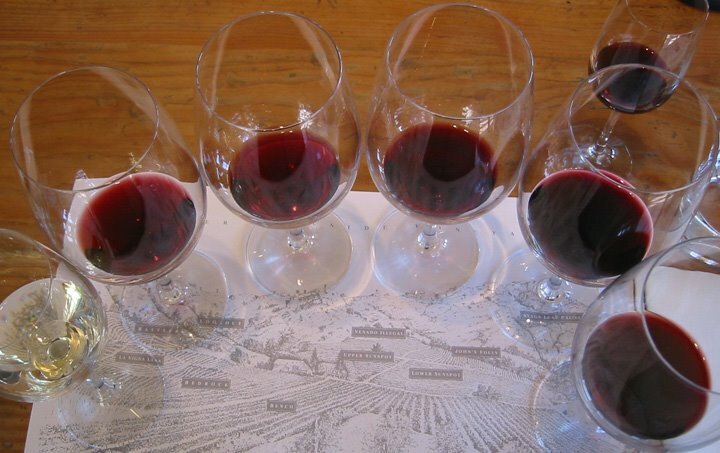 How many women winemakers are there, and how many Chinese women winemakers are there? She is the only Chinese woman winemaker I know, and she came to sit and talk to us while we tasted our wine. She was born in China in the same provence of my mother's family. During the Cultural Revolution, her family sent her to London to leave China and to be educated. She had nothing, and she was taken in by the Catholic Church. Through the kindness of the church which give her a fighting chance to live, she excelled in school, got to live in great European cities, work in interesting places such as with the Coco Chanel House, and earn a PhD in Industrial Psychology. Through all this, she said, she owes her life and fortune to the church which took her in, and her way of paying back is to make the finest wine for a charitable education fund. Mrs Newton went around and hand picked cabernet grapes from Mondavi, Phelps, Newton, Beringer etc and make a limited 2001 vintage. It is called Brother Timothy for Brother Timothy who started the LaSallian Education Fund, and 100% of the proceeds goes to the LaSallian Education Fund. I got one bottle, the most expensive bottle I have ever gotten, but well worth it. I have not opened it yet, but when I think the time is right, I will raise my glass to excellent education for those who are recipients of a LaSallian Scholarship. Shafer Vineyards in the Stag's Leap District of Napa should not be confused with the Shafer Vineyard Cellars in Oregon. I have not been to Oregon, but I have been to Shafer in Napa. This vineyard sells a 100% cab called Hillside Select, and currently the consumer price is about $175 per bottle. At the wine tasting, they served us a 1995 Hillside Select, which was velvety, smooth, with a chocolatey oak hint to it. Tasting this wine was knowing when excellence is excellence. Some young wines are bit assaultive to the tongue, and then there is this 10+ year old Hillside Select which was distinctly luxurious. It is my favorite Shafer ever! The jibe about the Hillside Select is that it sells out in a short order, it is out of my price range, and the bottles need to rest for a decade or more before sipping this perfection. 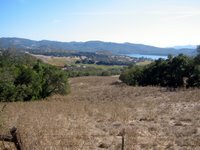 It is ridiculous of me to think that I might be able to find a Hillside Select in the middle of TN, if people in Napa and the Bay Area can't even find it. If there is anyone out there who wants to give me a Hillside Select, feel free!! Oh, there are other types of wine Shafer offers, but I just cannot tell you about them right now because I am so hooked on the Hillside Select! The tunnels where the barrels are kept are crazy too. It was cool, clean and catacomb like. The barrels went on and on and on down each hallway of the tunnels. I bet it would have been cool to be a kid in the tunnels playing pretend spies and robbers. One interesting reality about this vineyard is that operates under solar power and organic principles. 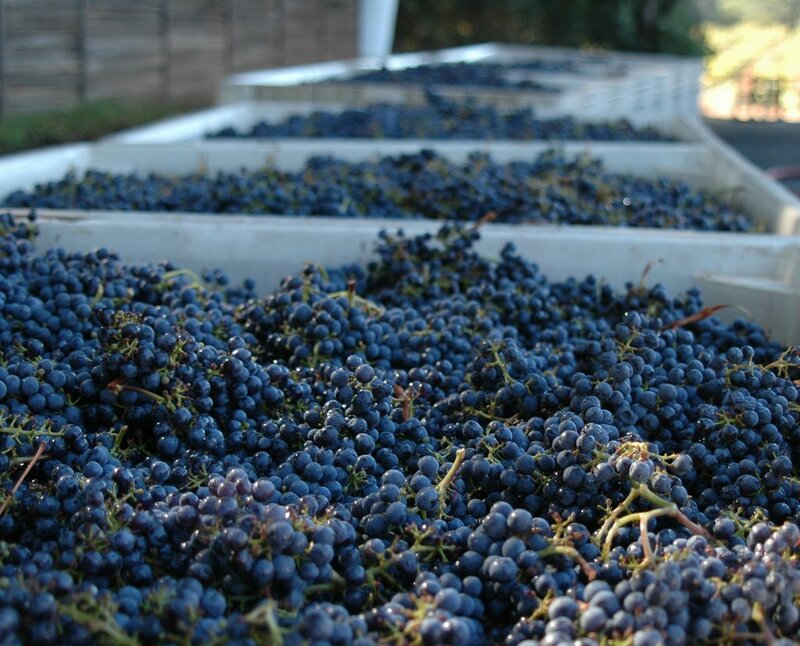 The Shafers and Elias Fernandez (Winemaker) strive to truly be eco-friendly, and eco-sustainable. 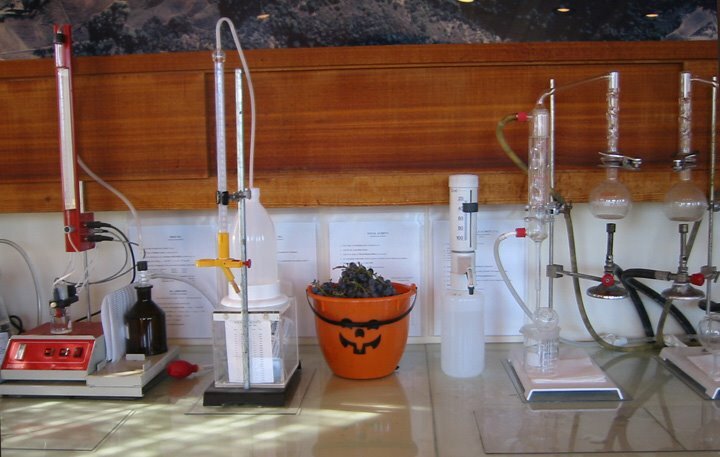 When other vineyards are dying from pesticide use, and high energy costs, Shafer will be there with their traditional and sustainable methods of making wine. 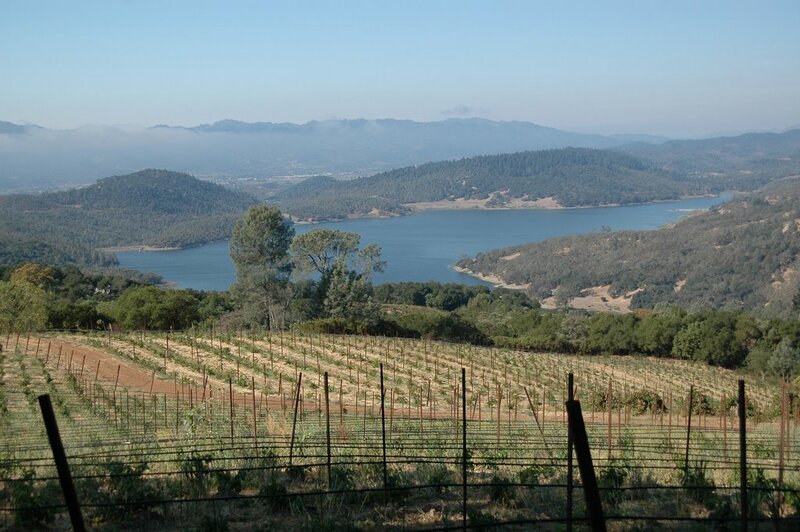 Chappellet is a family owned vineyard with lovely rows of manicured vines, lovely rolling hills, and a view of the valley reservoir that is breath-taking. 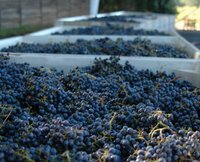 2005 was a great harvest year for California vineyards, so when domestic 2005s come to market, be sure to grab yourself some bottles, lay them down, and enjoy for years to come. 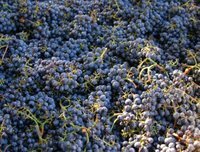 The grapes were late this year, as everyone said in Napa, but the conditions were prefect for to produce the perfect grapes. Look at these grapes, dunno what kind they are, but aren't they just pretty? 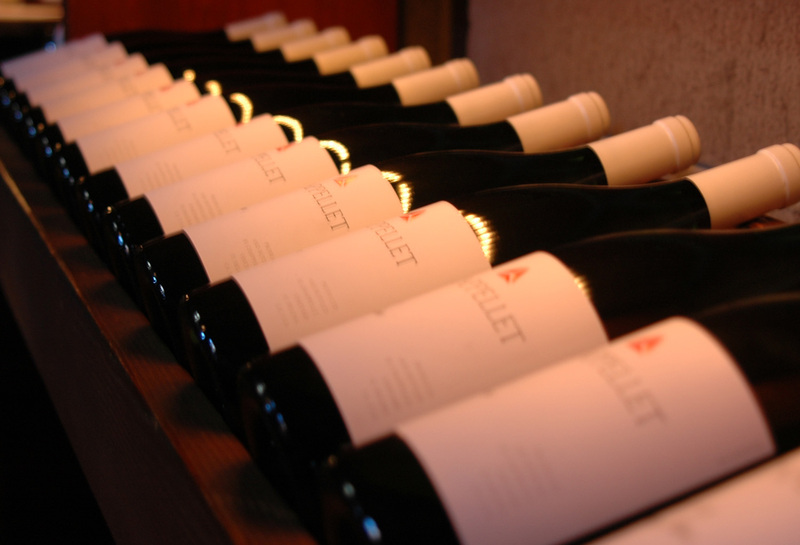 The Chappellet Winery tour is by appointment, and can be made by calling 1-800-4-Winery. How did Chappellet get that phone number ? Good for them! There is a guest reception building up on top of Prichard Hill. The reception area is attached to the fermentation and aging room and there are doors on the far end that leads to more of the vineyard. We spent a lot of time with our hostess looking at the process of making wine, and all the stainless steel equipment. 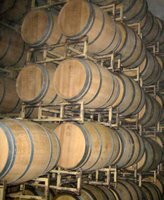 When we got back into the barrel aging room, there was a dark wood bar with chocolates and wine glasses lined up just for us. How delicious it was to taste wine and then take a bite of chocolate! I totally get it now! Excellent reds with bittersweet chocolate is the definition of decadence. What a nice way to start a tour of St Helena, CA. 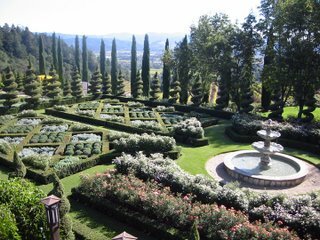 As we were leaving the wine tasting, we asked to have lunch in one of the Chappellet gardens. The garden we went to was high on a hill and there were a couple picnic tables and a trash can for use. We drove across one hill to this lunch spot. 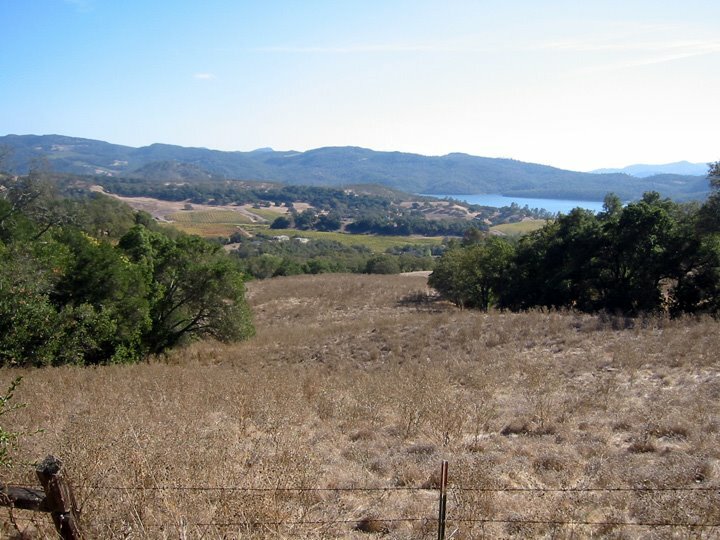 Notice the rolling hills in the background, the beautiful reservoir in the mid-field, and a new vineyard in front of the picture. I gotta tell ya, this picture just does not do the beautiful view justice. I look at the photo now, and say it is nice, but multiply the nice by 1000 and that is how the view is from this lovely place. The view was a feast for our eyes, and we were about to start a feast for our tastebuds. Before going to Chappellet, we went to Sunshine Foods www.sunshinefoodsmarket.com down at 1115 Main St, St Helena, CA 707-963-7070 to pick up some cheese, pate, bread and fruit for lunch. This neighborhood market had the best produce of any grocery store I have ever been in, and the avocadoes were ripe and ready to enjoy without being over mushy or bruised. The cheese counter is as good as the cheese shop at PennMac on the Strip in Pittsburgh, and there was a really great butcher on deck at the meat counter (Wild Oats, take notice!). We got a few types of cheese, pate, some freshly made french bread, and grapes to eat for our lunch. Gorgeous food, gorgeous view, good company and great wine. Does life get better than this? Rumours is a locally owned wine bar in the renewed 12 South neighborhood. Actually the owners of Rumours also own, or are part owners of 5 businesses with more on deck for 12th Ave South. I really appreciate these folks for keeping the architecture of the area, while sprucing up the facades, to make a rather hip urban area to walk around. Rumours has been a place were people like me can just go for an hour, kick back and relax with some wine, munch on some cheese and white bean hummus, and feel like I was just at an old friends house. 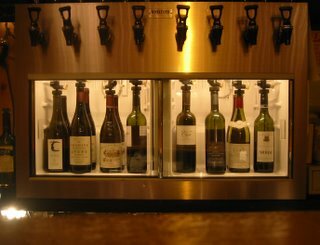 When Christy and Whitney first opened the wine bar, they claimed they did not know a whole lot about wine, but as days, weeks and months go by, their wine list has grown to house a lot of wines from every corner of the earth that grows grapes. The last time I was there, I got a fun sparkling Pinot Grigio, which had a sparkly bubble-action on the tongue with a nice light fruity flavor. It is kind of a strange wine because it is not sour like a cheap California sparkling wine, and it is not bready like some champagnes. There are so many wines by the glass, that I could go back time and again. The food is what you might expect from a rustic wine bar. There is the classic cheese and fruit plate, crackers and spreads like roasted red pepper or white bean hummus, salads, pasta of the day, some items with crab that changes daily, and a few other things that I have not tried yet. The cheeses at Rumours are great because the owners have a stake in the Italian Market and Cheese Shop right down the street. There is a year aged Manchego that is nutty with a bite to the teeth that makes me feel so pampered every time I take a taste. The fun part about this place is that you can grab a glass and walk next door to create art. The Art House Nashville www.thearthousenashville.com is good for looking at local artists art or creating your own pottery, mosaic, jewelry, painting, prints or whatever floats your boat. What a great concept, paint a picture while discovering a new grape! One Friday evening, I went to the Art House to the "Better than a Bar" art time, I painted a mug. It is always better to paint a mug with a little vino and cheese! 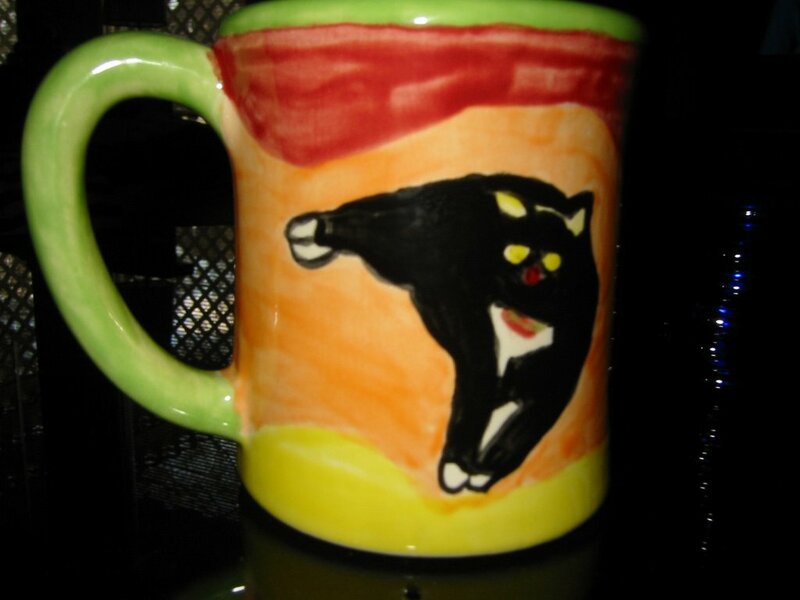 Make note of my mug and my photographic-esque painting of Kitty, the house cat. For those of you who know Kitty, can you see how lifelike I made this picture? ha ha ha ha! 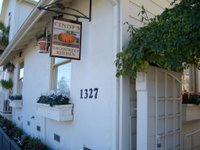 One aspect I like about Cindy’s is that it is in wine country, and there is an extensive wine list of many wines from Napa and Sanoma. The waitstaff has a wide range of knowledge of wine, as they should because local vineyard owners, wine experts and wine tasters dine here, and they need to know what they are talking about. 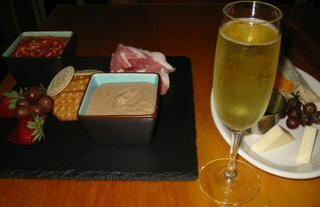 I do not know a whole lot about wine, and I learned a lot about wine and my food at Cindy’s. We got a white zinfandel for the table and I began to panic. I was thinking we are getting some nasty 1980’s “get the date drunk” type of wine cooler that had a “zinfandel wine spritzer” label on the screw-cap bottle. I learned that REAL white zin is made by crushing the dark red/purple zin grapes, and all the skins are removed from the start instead of letting the skins sit for a week (which adds the tannins and ruby color to wine). 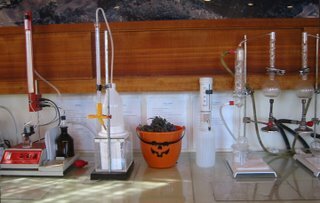 The remaining white zin juice is then fermented as if it were a white wine like chardonnay. The result of the white zin is a light, refreshing and very sippable wine without the sour apple front that some new chards have, and without the heavy tannins like the kin red zins have. I have learned that real white zins are NOT that bad stuff of the ‘80s. Our table started off with one Oyster Pablo per person. What a mistake that was! We should have ordered a Dozen per person because we love these little gems. The mouth feel, the comfortable simplicity yet elegance of the oyster was divine. Don’t be like us, order one more than you think you want to eat because you are going to wish you ordered just one more. I ordered the duck as my main dish. I always order duck when I can get good duck because it is so hard to make good duck. In my attempts to cook duck, I have made duck only once in a way that was really good, moist, yummy and a thin crispy skin on the outside. Other attempts were dry, stringy and fatty, or fatty, rubbery and nasty – all the rest of my attempts were disrespectful to the duck lying on my plate. 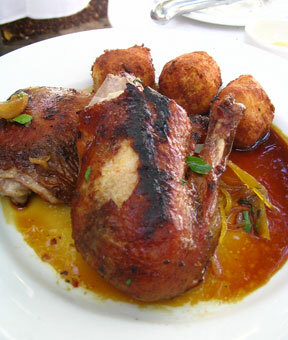 Anyway, at Cindy’s Backstreet Kitchen, the duck was cooked moist, defatted, and the outside was crispy. It was the perfect preparation of duck. It was simply delicious. I don’t know what category to put Cindy’s (and Margot’s) in. Do people call this style of simple and awesome – the New Classic American? I dunno, I just love it.